It was great to get out birding again after all the recent rain and a trip to La Mata is always enjoyable. About 30 people turned up to the CBBC field trip and it was good to chat and get to know a few more people, I even found another Wolves fan! Putting football aside there were lots of small birds flitting about amongst the vines, although most of them turned out to be Black Redstarts! That may be a bit of an exageration as we also saw small flocks of Goldfinches, Greenfinches, Linnets and Serins. Various Larks were also around but Buzzard and Kestrel were the only raptors we saw. On a more positive note, at one point I was looking at twoHoopoes, a Green Woodpecker, two Goldfinches and a Stonechat all in the same tree! 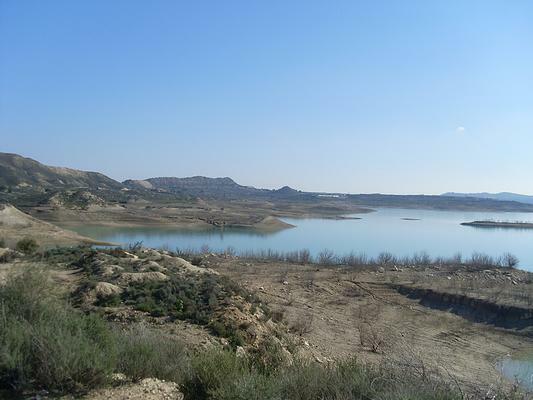 We left La Mata and had a short stop by the Embalse de Pedrera, which was fairly quiet apart from small numbers of Black necked Grebe, Grey Heron, Cormorants and a few distant ducks. Our ‘super bird spotter’ friend Dave found a Peregrine Falcon sitting on a rock, embarrasingly, I had previously dismissed it as just another rock! Clearly my eyesight is not getting any better! After a pleasant lunch in Torremendo we moved on to our usual parking place opposite a ridge in the Sierra de Escalona. Some of the group went for a stroll in the woods but I stayed at the parking area and was rewarded when someone found two Little Owls sitting next to each other by a little house, soon followed by two Mistle Thrush sitting in a tall, bare tree. A Green Woodpecker was also heard and seen while we waited to see if any raptors or owls would show up. A Buzzard was the first to pass over the ridge, followed some time later, by a possible Bonelli’s Eagle and another possible Golden Eagle or it could have been another Bonelli’s Eagle. Unfortunately the hoped for Eagle Owl had failed to show up by the time we left at about 6pm.